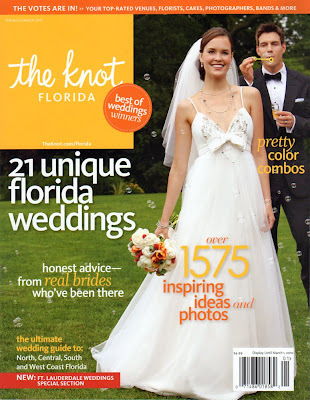 Tonight Jeff picked up The Knot Florida issue, spring/summer from Publix. The cashier asked him if he was getting married, then saw his ring and said, "Oh, you are married." 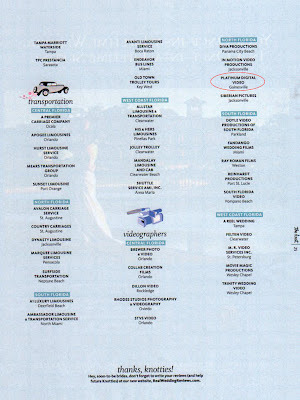 He said he felt kind of odd being a married guy buying The Knot magazine and so he explained that our Gainesville wedding video business was listed in there! So he brought it home and we were happy to see Megan and John's wedding as a full page feature in the "Real Wedding" section. Her wedding film highlight is featured on the home page of our website and on our Vimeo page if you would like to check it out. 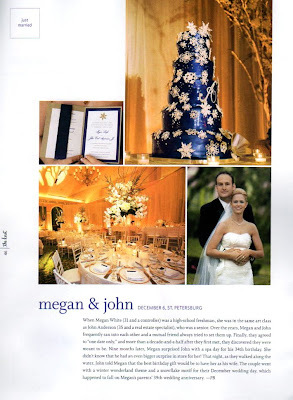 Megan was one of the brides who helped us get The Knot best of, (also listed in this magazine). Thanks to all of our couples who voted for us!